Ask UC San Diego to attend your college fair or present to your high school, community college, or community based organization. Invitations to attend an event outside the United States should be submitted through email. You can direct questions to requestschoolvisit@ucsd.edu. Counselors! 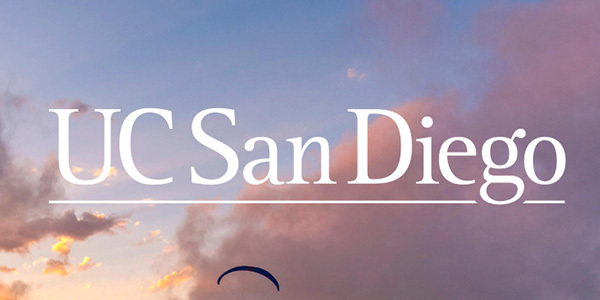 Are you meeting with a student right now and need fast access to important information about UC San Diego? We want to help. 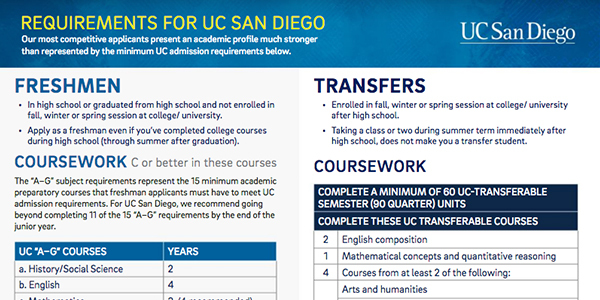 On the UC Application, students should indicate their desired major. If it is on this list, they should also indicate an alternate major. Visit catalog.ucsd.edu to see the complete list of majors. Visit Freshman Requirements or Transfer Requirements for full details. Applicants to the following departments and the Jacobs School of Engineering must complete minimum coursework to be admitted into the major. Students will be screened for the number of courses completed, the grades earned in those courses and cumulative GPA. Visit Transfer Major Preparation for full details. Campus approved plans for the largest building project to date: 10-acre North Torrey Pines Living and Learning Neighborhood will include academic, residential, commercial and cultural spaces. The new OceanView dining hall opened in Thurgood Marshall College, offering kosher and halal dining options. 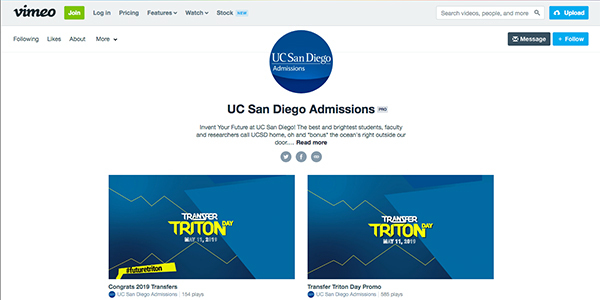 Each UC San Diego college offers 2-unit First Year Experience courses for freshmen and transfers. These courses address challenges students often face transitioning from high school and community college to a large research university. Faculty lead weekly lectures and undergraduate leaders host smaller discussions. Students gain: effective research and study skills, stronger time management skills, enhanced communication skills, more confidence interacting with faculty, and much more. UC San Diego's Co-Curricular Record (CCR) is the first tool of its kind in higher education, highlighting student achievements in opportunities beyond the classroom. The CCR provides students with a brief description of their accomplishments and the skills they developed during their undergraduate years. It is validated by the registrar and helps students with their job search by making connections between academic skills learned and marketable competencies, "soft skills," which students have developed and demonstrated in and out of the classroom.